Consign your gently used men's and women's clothing, shoes, and accessories. We accept items seasonally–currently accepting SPRING items. A minimum of 10 items is needed to start a contract (exceptions may be made for high-end items). Our favorite thing about consigning? Reducing tons of clothing waste in landfills, while getting paid for it! Thinking About Consigning? Start Here. Clothing should be laundered and folded in a bag or box - no hangers please. Shoes and accessories should have minimal wear. We also accept jewelry and watches in working condition. We are looking for contemporary styles, 1-3 years old. Exceptions may be made for designer items. 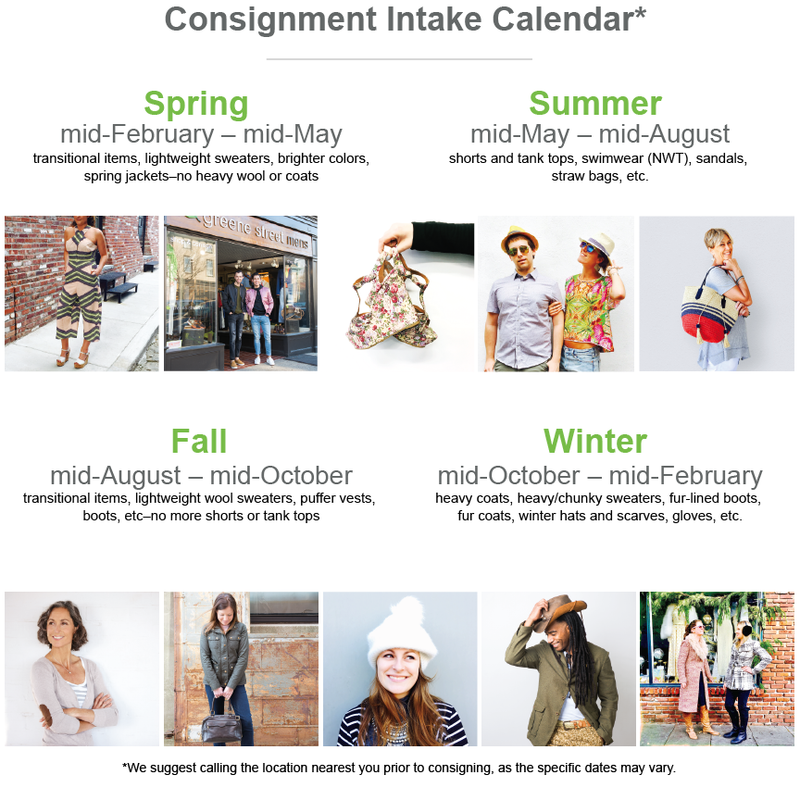 Be sure to check our Consignment Intake Calendar to ensure that your clothes are in line with our seasonal needs. Bring Your Items to Your Nearest Greene Street. No appointment is needed, so come in any time. We will ask you to stay in the store while we look through your things. If we are able to find at least 10 acceptable items, we will give you a drop-off receipt. our system. Items may be further passed-on at this time. You will then receive an e-mail containing your itemized price list. The e-mail designates the start of your 60 day contract and contains important information regarding reclaiming unsold items. In the top left corner of your e-mailed contract, you will find your Claim Date. Your Claim Date is the final day of your 60 day contract and the LAST day to pick up unsold items. You may come in to reclaim any unsold pieces on your Claim Date or up to 5 days prior. Please allow up to 1 hour for reclaiming. Please note that anything left in-store after your Claim Date, immediately becomes property of Greene Street. If you have any additional questions, please visit our FAQ page or feel free to contact your local Greene Street.